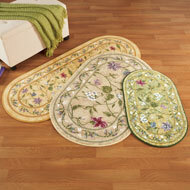 These lovely rugs let you add beautiful style and color to your home while protecting your floors. 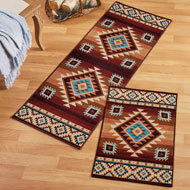 They feature an intricate Aztec pattern in classic Southwest colors of tan, chocolate, ivory and turquoise. 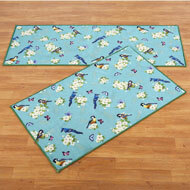 The striking rugs have a skidresistant backing and are available in two sizes (sold individually). Hand wash. Latex and nylon; imported. Choose: 20" x 30" or 22" x 60". Beautiful colors, a classic design and a soft feel will make these rugs a welcome addition to your home. 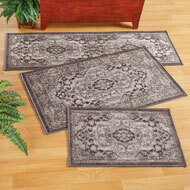 Available in 4 different sizes, the tufted rugs feature a plush double border design and have skidresistant backings. Machine wash. Nylon; made in the USA. Choose: Deep Purple, Burgundy, Linen, Oregano or Blue. Available in: 20" x 34", 24" x 40", 30" x 46", or 24" x 60". Beautiful colors and a charming design make this oval rug a wonderful addition to any room in your home. 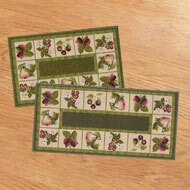 Available in three sizes, it features a lovely pink and purple floral design atop a gold, green or beige background. Skidresistant backing. Machine wash. Nylon; made in the USA. Choose: Beige, Gold, or Green. Available in: 20" x 34" Oval, 30" x 46" Oval, or 22" x 60" Oval. Inspired by beautiful coastal scenery, this blue and white rug features ships, shells, anchors and other nautical icons inside a pattern of diamond shapes. The images are framed by a striped border in blue and white, and the reverse side is skidresistant. Hand wash. Nylon and Latex; imported. Sizes available in 20" x 30" or 27" x 45". 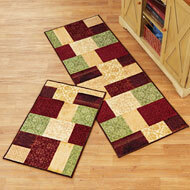 Add color and elegant style to any room in your home with these lovely accent rugs. Each rug features beautiful scroll and floral patterns in shades of blue, navy and white on top of a light blue background. Available in two sizes. Skidresistant backing. Hand wash. Nylon and latex; imported. Size available in 20" x 30" or 27" x 45". 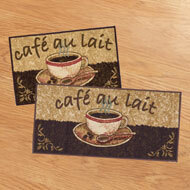 Pretty colors and delightful details make these rugs a beautiful addition to your kitchen décor. 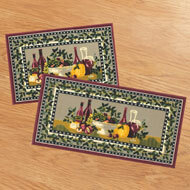 Printed rug features a border of different fruits with floral accents and a skid resistant backing. Nylon. Machine wash Set of 2 includes one 20" x 30 " and one 20" x 40". This item ships from a separate warehouse and will arrive in a separate package. 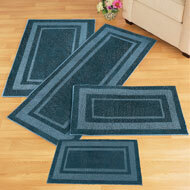 Perfect for protecting your floors in high traffic areas, these accent rugs are perfect anywhere in your home. 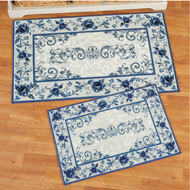 These beautiful rugs feature a classic medallion design in blue or tan. Nylon and latex with skidresistant backing; imported. Machine wash. Choose: Blue or Tan. Available in: 20" x 30", 26" x 45", or 20" x 59". 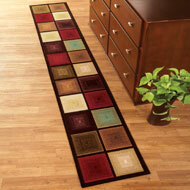 This beautiful accent rug is a great way to protect your floors while adding seasonal color to your home. 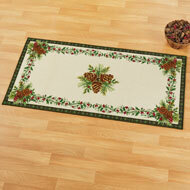 The attractive rug features a lovely design of pinecones and branches against an ivory background with a holly border design. The outer edge has a green and red plaid border. Spot clean. Skidresistant backing. Nylon and latex; imported. 60" x 29 1/2". Beautiful colors and a bold, graphic design make this large rug the perfect way to add style to any room in your home. 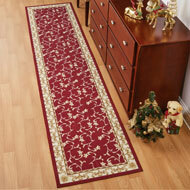 Almost 7feet long, this lovely rug is the perfect way to anchor a seating area or fill a large foyer. It features rich colors and a skidresistant back. Machine Wash. Nylon and Latex; imported. 83" x 59". 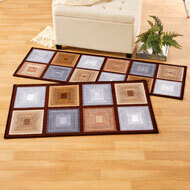 Protect your floors and add some geometric style to your home with these attractive accent rugs. Each rug features richlycolored squares in beautiful shades of ivory, sage, chocolate and burgundy with chocolate binding. Hand wash. Sold individually. Nylon and latex with skidresistant backing; imported. Size available in 20" x 30" or 22" x 60". 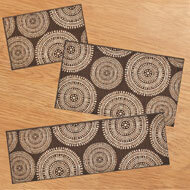 Protect your floors with these attractive rugs that feature a lovely geometric design. Each rug features richlycolored squares in beautiful shades of ivory, chocolate, tan and slate blue, surrounded by dark brown borders. Machine wash rugs. Spot clean runners. Sold individually. Nylon and latex with skidresistant backing; imported. Available in: 26" x 45" or 20" x 59"..
Beautiful colors and a charming design make this rug a wonderful addition to any room in your home. Available in two sizes, it features colorful birds on flowering branches surrounded by bright butterflies atop a light blue background. Skidresistant backing. Hand wash. Nylon and Latex; imported. Rug sizes available in 22" x 60" or 27" x 45". Extra long runners let you protect the floors in the longest of hallways! 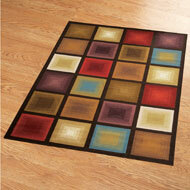 Featuring squares of rich colors, this beautiful rug is available in two lengths and has a skidresistant backing. Spot clean. Nylon; imported. Sizes available in 20" x 90" or 20" x 120". 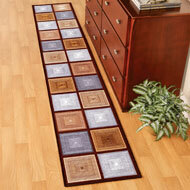 This versatile runner is the perfect way to protect your floors in any hightraffic area in your home. Available in two beautiful colors and two different sizes, the rug has a scroll pattern in the center with a contrasting scroll border. Perfect in hallways, foyers, kitchens and more. Skidresistant backing. Hand wash. Latex and nylon; imported. 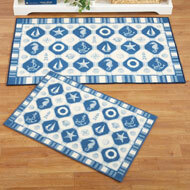 Protect your floors with these attractive rugs that feature a lovely geometric design. Each rug features richlycolored squares in beautiful shades of ivory, chocolate, tan and slate blue, surrounded by dark brown borders. Machine wash rugs. Spot clean runners. Sold individually. Nylon and latex with skidresistant backing; imported. Available in: 20" x 90" or 20" x 120".  This extralong runner is perfect for protecting your hightraffic areas. The beautiful lattice runners feature scrolling borders and are perfect for hallways, foyers, or anywhere in your home. 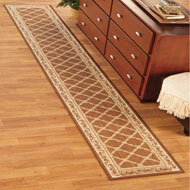 Two different lengths let you pick the perfect rug for your space – up to 10 feet long! Skidresistant backing. Spot clean. Nylon & latex; imported. Color available in Green or Mocha. Size available in 20" x 90" or 20" x 120".